Einheit is one of the many companies who has taken advantage of one of Pepco’s managed services offerings; the VMI (Vendor Managed Inventory) program. The VMI Program saves time and money by making sure jobsites are stocked with the materials needed to complete day to day tasks. The idea behind this new method of jobsite management is simple… we provide an on-site 40’ storage unit, complete with bin-located racking, overhead lighting and open space for bulk storage. For the Einheit job, Pepco is supplying a Conex Box stocked with material specifically needed for the job. 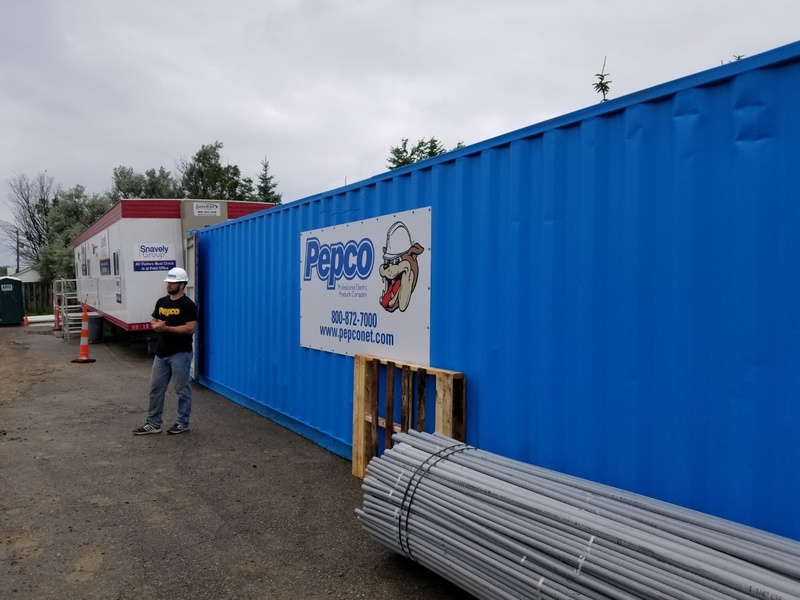 Other Pepco VMI services include Conduit Carts, Wire Reels, Lighting Racks and Knack Job Boxes to help ensure jobsites are stocked to keep up with construction deadlines. Pepco also has a self-unloading flatbed truck for easily moving material. Pepco’s customer service is top notch and fast responding to any difficulties a customer may face. Our VMI team is compiled of veteran Dan McCurdy and AJ Strnad from the Construction Sales Department, who personally make visits to VMI program jobsites weekly to ensure everything is running smoothly and to make sure the customer has a full understanding of how it works. They are always on call and readily available to go to these jobsites when their assistance is needed. Pepco’s Managed Services Programs are set to make the job easier for both lead foreman of Einheit, Universal Windows, Andy Hausler, and everyone else on the field. By using Pepco VMI services and our Site Managers to keep the process fluid through rapid reorder and replenishment, the expectation is for this job to be completed by January 2019.